This isn't really in keeping with the spirit of this thread, which exists only because of the incredible effort, generosity and patience shown by contributors to help others (and each other) get the best deals. If you know of a deal that offers £1/TP then please share it so everyone can benefit. Sometimes it is not wise to openly share everything. That is how things can get pulled. But given that WTP was mentioned I am sure I could figure out fairly easily what nufnuf77 was referencing and how this could be £1/TP. Although not guaranteed. I am sure I could figure out fairly easily what nufnuf77 was referencing and how this could be £1/TP. Other threads exist for the smug "I know a great fare and I'm not telling you" sort of post. I'd like to think this thread is different. nothing more to add, keep looking. I am hoping someone can help me... I need to go to Fort Myers in early April and return from Cleveland mid-late April and have been trying to find a fare to maximise TP. The best I have found is about £1500 in Business with 2 stops out and 1 on the way back, and nothing in Premium with a TATL on BA (I have a GUF I could use). This might be the best I can find, but it also might be because I'm not very good with forcing extra/multiple segments on ITA Matrix. Would anyone be able to point me in the right direction? I am price sensitive (I assume we all are!). Happy to go ex-EU or ex-INV. Don't need the internal leg at this point. Happy to go business or Premium Econ and GUF on any european/TATL legs (with the knowledge it's econ in the USA). No specific requirement on TP, just a good ratio TP/Price. If there is a particular routing etc you could suggest I'm happy to keep looking, but I don't seem to be getting very far on my own! Thank you in advance. I would start by finding a TATL that you are happy with that will allow you to use your GUF. Once you have this then you can force matrix to search using the specific flight code. Once you have this you can then start to play around with origin and connections to your destination. Because it’s not necessarily just about being a great fare. Besides which, I think you will find I have consistently tried to help others on this thread, contributing significantly on the F fare to PHX, as well as through PM to various posters. Therefore I resent your accusation of being ‘smug’. It is the wide publication of such things that get them pulled, especially when picked up by other sources. I’m sure if you sent nufnuf77 a PM he would have explained. However, not so sure now that you are throwing out accusations. AdBoy, nufnuf77 and Gastrocnemius like this. Hi Madfish... apologies I'm still only just 'graduating from Primary school' as it were re ITA so I might need a bit more help.... This seems like a good suggestion but as the flight to Fort Myers and back from Cleveland both have numerous entry points I'm a bit lost on how to start. I don't mind what entry point, it just needs to be BA if I'm going to GUF. Can you give me any other suggestions... is there another way to try and seach as any routing works for me and/or at the moment. If I can find a good price and GUF that is great, although I wonder if for TPs it's better to look for Club from the start? Sorry is this too open a query? Hi Madfish... apologies I'm still only just 'graduating from Primary school' as it were re ITA so I might need a bit more help.... This seems like a good suggestion but as the flight to Fort Myers and back from Cleveland both have numerous entry points I'm a bit lost on how to start. I don't mind what entry point, it just needs to be BA if I'm going to GUF. Can you give me any other suggestions... is there another way to try and seach as any routing works for me. Do you have the BA app? If so, you can search for avios availability by continent. This will allow you to get an idea of what might be available by area, cabin and month. I would probably start by looking at getting into one of the bigger East Coast cities. Something like BOS/JFK or down to MIA. Once you have this you can start looking a little bit closer. If you can find those first and give dates I or somebody else can maybe find you something based on that. Can probably also provide some screenshots of what you do on matrix. I am reminded of Fermat's Last Theorem: "I have discovered a truly marvelous proof of this, which this margin is too narrow to contain"
flyerkit and nufnuf77 like this. There goes my afternoon of working! I'm sure theres a magical way you do it quickly, but I'll resort to a pad, pen, and AA website to see what flights are going when! You're right - there are threads that exist for the smug. And, there's even a while forum for Tips & Tricks. Once you understand it, it's extremely advantageous. It isn't easy to just pick up, so requires a bit of personal effort. But, smugness and not wanting to close an open avenue, are very different. You've been given a few tips further above in terms of what to look for. Sure, it will require additional reading and understanding, but that's the way FT works. 12 months ago, for example, I couldn't use Matrix. I was reliant on others to tell me precisely what to do, and fortunately there were helpful guides and tips on FT. If I needed specific help, others would happily message me back but only for very specific questions. Fast forward, and I can happily use the site myself for the basics. It took time, but it's worth it, and means I can contribute fares if and when I see them. That, is what a community teaches you. madfish and aidy like this. There is no real magic way of creating a routing, just a bit of time plugging through the options and selecting the most logical flights. AA's banking system does help to keep things a little more simple. Happy to help once you have an idea of what you want to do, and are fixed on dates. I'll have a play today, and let you know how I get on. Any use? I'm not sure how a GUF works, and whether you could or would want to use it on the WT+ leg home. Putting Helsinki in the outbound for an extra 80TP adds about £132. Outbound as it stands would be 300TP, I'm not good with WT points but I think it's 20+90+20 for the way home. This is my first post in FT, and I'm pretty new to this. I've been skimming the thread and I think it's really interesting. I am based in Austin and I travel to London once or twice per year. I will have some free time in London all day Saturday May 5th - Tuesday May 8th, and I would love to use this time to do a 500+ TP run. 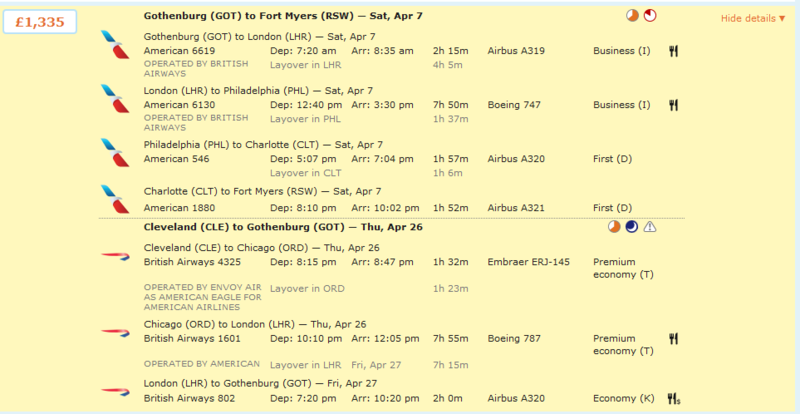 I have been learning the prices around that time exLondon, and I have been playing around with different itineraries. I want to only go through UK immigration once (they normally get sketchy when you enter the country multiple times in a short period of time), so I plan to take advantage of LHR's immigration-less connections. I calculated 560TPs, which is ~£ 2.98/TP. Are there any specific routes I should look into that are valid during that time frame?